James le Palmer (d. 1375) was a London Clerk who, as he tells us in the introduction, consulted over 100 different texts in compiling this vast encyclopaedia of canon law, theology, and general information. James wrote the book himself, which was a huge undertaking: in its present, unfinished form (the encyclopaedia runs out of steam after the letter 'M'), the text runs to well over very 2000 large pages, decorated with over 800 illustrations. The text concerning 'Absolution' explains that clerics can only absolve other clerics of lower rank, and that priests should not exact undue penance when hearing confession. 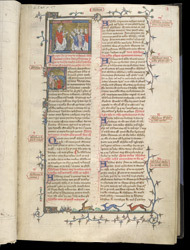 The miniature shows bishops being absolved by the pope (because no-one of lower rank can do it), and the historiated initial 'S' shows a priest confessing a layman.